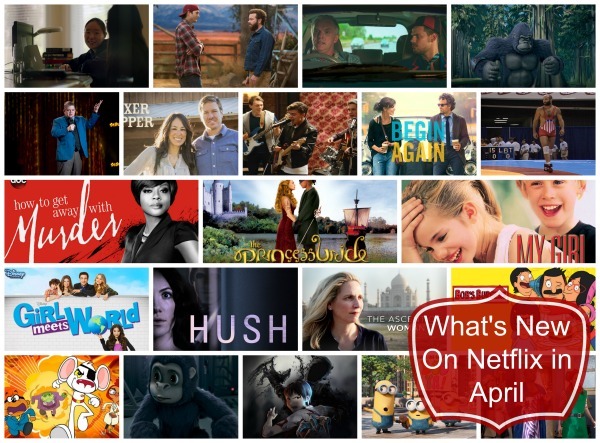 See What's Coming To Netflix In April! See What’s Coming To Netflix In April! As part of the Netflix Stream Team I received a year membership to Netflix, a Roku TV and some other fun items. While I loved the goodies they sent they don’t influence my views or how much I love Netflix. All thoughts are completely my own. The end of March is almost here, which sadly means, some great shows on Netflix will be saying goodbye until sometime in the future.Fret not, though! As always, Netflix is bringing some great movies and shows to replace the ones that will be leaving. Before we get to what’s coming here are the shows you will want to catch before April 1! Now, because I can’t leave you all in a sad state, here is the goodness that is coming to Netflix in just a few days! Also for the little ones, Netflix released some great titles in March, so be sure to check those out: LEGO Bionicles, LEGO Friends, Pee Wee’s Big Holiday, Veggie Tales: In The House, The Mr. Peabody and Sherman Show (season 2), Dinotrux (season 2), and many more kid-friendly shows and movies. We have been having a blast watching our shows on Netflix (aka binge watching Grey’s Anatomy for the 1000th time). Our spring break was so rainy and cold (yes, it gets cold in Florida) that we were extra thankful for Netflix because we watched a lot of it! We even got to have a little building fun thanks to the LEGO sets they sent us Stream Team members! What are some of the shows above you are looking forward to seeing when they come to Netflix in April?